My friends Ruth and Kaye and I have made it a bit of a habit of late to meet for dinner and a movie on Friday evenings. I confess it’s a lovely way to end the week. But at $10.75 a pop, I can’t make it too regular of a habit. But we did go see X-Men: First Class a couple weeks ago. It was so worth the ticket price. I think it only fair to say that I am not a comic book nerd, and I wouldn’t know if they changed anything–even significantly. What I do know is good storytelling. And my boy James McAvoy and Michael Fassbender made this story come alive. They were superb as Charles Xavier and Erik Lehnsherr (Magneto) respectively. Of course, I’m predisposed to love anything staring JMcAvoy (should I just start calling him J-mac for short? ), but this really was a good movie. In keeping with some recent lists (and borrowing format from my hero, Jenny B. Jones), here are my 7 favorite things about the movie. 1. It co-stars the girl that’s going to be Katniss Everdeen in the Hunger Games movie next year. 2. Before the Beast is a beast, he’s just a nerd. A really smart one. 3. Erik and Charles have a wonderful bromance that just makes me smile. 4. I didn’t once look at Erik and think about Rochester from Jane Eyre (even though he was great in that, too). 6. There were some EXCELLENT cameos. That’s all I’ll say about that. 7. James McAvoy uses Jedi mind tricks on an unsuspecting Oliver Platt. DE–LITEFUL! Have you seen the movie yet? What did you think? I figured that today I’d offer you two Friday Favorites for the price of one. I was first introduced to Scottish actor James McAvoy playing Tom Lefroy, Jane Austen’s love interest in Becoming Jane. I rather enjoyed the film, even though it has quite the sad ending, but the truth was that I couldn’t take my eyes off the very handsome James. 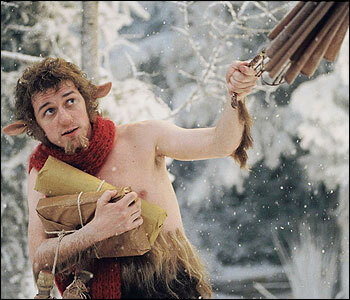 He’s a ridiculously wonderful actor, so I started searching out his other movies, and soon realized that I had actually already seen him as Mr. Tumnus in The Chronicles of Narnia: The Lion, the Witch and the Wardrobe. I was suitibly surprised by this realization, but I went back and watched it again and promptly decided I might have a small crush on a fawn. Mom says I’m strange. Anyway, shortly thereafter I discovered he was going to be in another movie Penelope–my second Friday Favorite of the day. It came out the end of February 2008, and I knew that I was heading out of town for a business trip, so I talked my friends into joining me for a Friday night showing–which is pretty strange for me, as I never pay full-price for a flick. It was better than I hoped it might be. An adorable, modern-day fairy tale about learning to love yourself before you can ever love someone else. James plays opposite Christina Ricci, and they have fantastic on-screen chemistry. If you haven’t seen it yet, don’t miss out! James has been in a wide variety of flicks including The Last King of Scotland, playing opposite Forest Whitaker’s Oscar Award-winning performance and Idi Amin. He plays Robbie Turner in Atonement with Keira Knightley. He’s also done a slew of TV and movies from the UK. While I have seen some of his movies that I didn’t like, I’ve never thought he did a poor job in any of them. And strangely enough, I was talking with my newest roommate Leslie one day, and she mentioned that her fiance Rob loves this actor … James McAvoy. Turns out Rob and I have a lot in common in the favorite actor category, and I knew he was a quality guy on the spot. 🙂 Good pick, Leslie. Confession: I’ve been trying to make one of my book heroes look like James, but he’s just not big enough to “play” a hero in a romance book. Hmmm … I’ll noodle on it until I come up with a good idea.